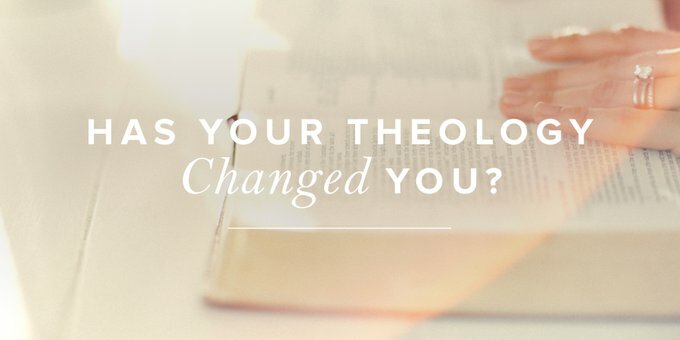 Has Your Theology Changed You? Do you love theology? I do. I love to fill my head with knowledge, and the excitement of learning new information can be a tad overwhelming (in a good way). Maybe you’re a theology nerd like me. Reading is your favorite pastime, you download sermons to listen to in the car, and you spend hours with your nose in your Bible and commentaries striving to better understand the Scriptures. You do this until your eyes burn, your head hurts, and your hand is cramped. Then once the learning is over, you close your books, turn off your sermons, set aside the Bible, and move on. My dear sister who loves theology, I must ask: Has this knowledge and theology changed you yet? Has your abounding comprehension found its way to your heart so as to shape your life? Do the words you speak, the thoughts you think, and the actions you commit represent the information in your mind? I do not ask this by way of accusation. I do not ask this as a person who believes we do not need theology. Neither do I ask this to condemn you or prove a point. I ask this as a loving sister who has committed the same mistake in her quest to know more. Though I could point you to Scripture to prove the sovereignty of God, my days were spent with worry. Though I could explain the doctrines of atonement and justification, I was living in legalism. Though I could write about the perseverance of the saints, I doubted my salvation. My head was full of theology, yet my heart was burdened with sin, despair, and hopelessness. My theology and knowledge were not shaping me. True change begun for me when God dealt with my pride through 1 Corinthians 8. In this passage, Paul answered the Corinthians’ concerns about food sacrificed to idols. Being in a pagan culture where many other gods were worshiped, often the meat bought in the marketplace had been sacrificed to idols, making it common that the meat served at meals had first been sacrificed. Some Christians worried that it was sinful to eat such meat while others believed it was completely fine to do so. So, they consulted Paul. As long as your conscience didn’t bother you (v. 7). As long as you weren’t causing another to stumble (vv. 8–13). Before going into all these details, Paul prefaces chapter 8 with this: “Now concerning food offered to idols: we know that ‘all of us possess knowledge.’ This ‘knowledge’ puffs up, but love builds up” (v. 1). “Don’t let your knowledge cause others to stumble.” This was Paul’s call to the Corinthians who knew it was okay to eat meat sacrificed to idols. If their eating of meats sacrificed to idols caused another believer to feel guilty or question their faith, then such eating was sinful (see vv. 7–13). He also didn’t want those who had knowledge to become “puffed up” and think that they were better than those who did not, because “food will not commend us to God; we are neither the worse if we do not eat, nor the better if we do eat” (v. 8 NASB). In a similar fashion, my knowledge made me “puffed up” because I was not using it to love others. I looked down on those who did not possess the same amount of knowledge as me. I viewed other Christians as “less than” because they did not believe or even know certain doctrines of theology. Instead of having pride, I should have shown love to those people and felt compassion for those lost in false teachings. If this is you, too, let’s begin praying how we can show them the Truth rather than looking down our noses and complaining. Sometimes in our pursuit of theology, we do not use our knowledge to its true purpose. I know I sadly didn’t. Be filled with the knowledge of his will in all spiritual wisdom and understanding, so as to walk in a manner worthy of the Lord, fully pleasing to him: bearing fruit in every good work and increasing in the knowledge of God; being strengthened with all power, according to his glorious might, for all endurance and patience with joy; giving thanks to the Father, who has qualified you to share in the inheritance of the saints in light. Why did Paul pray that they would be filled with the knowledge of God’s will (i.e. Scripture) in all spiritual wisdom and understanding? So that they would walk in a manner worthy of the Lord. The purpose of theology and knowledge is so that our daily living would be to God’s glory. This includes thoughts, speech, and actions. Paul wanted this church to begin using their true knowledge to discern it from the falsehood they were being taught. God convicted me that I was not using my knowledge to walk righteously. Rather than using what I was learning, I was stowing it away in the crevices of my mind. It never changed me. My knowledge of God’s sovereignty and goodness should have eased my worries. I should have been able to look to 1 John and be convinced of my own salvation. I should have put off my legalistic ways in recognizing I was saved by grace alone. Maybe you are in the same place I was. Friend, don’t lose heart if you have only studied and never made application. Don’t take this precious time to only grieve your sins and how you have missed out on what Scripture truly has to offer. Remember the grace of God in opening your eyes to your sin and take hope in Christ’s atonement—He died for even this sin. Also, let’s make the those necessary changes we need to and work diligently to interpret and apply Scripture. I know this sounds daunting—it did for me—but God has not left us with simply a Bible and lifeless doctrine. He has made His Scripture living and active by the work of the Holy Spirit who abides inside our hearts. The Holy Spirit does the work of heart change with God’s Word as we rely on Him and strive to make accurate application. “But the Helper, the Holy Spirit, whom the Father will send in my name, he will teach you all things and bring to your remembrance all that I have said to you” (John 14:26). Because you belong to God, the Holy Spirit lives inside of you. Pray for God’s help and look to fellow sisters of the faith to help you along the way. Sister, allow your theology to shape you and alter your daily walk.